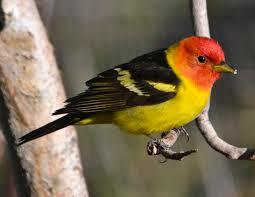 A Western Tanager visited at the birdbath and then at the feeding area yesterday. He only stayed for short while and I haven’t seen him again, but that short visit was superb! He is such a beautiful bird. I hope he was scouting the area and will bring his wife next time. I was so excited to see him because I haven’t seen one for at least 30 years. I just had to share this with you. 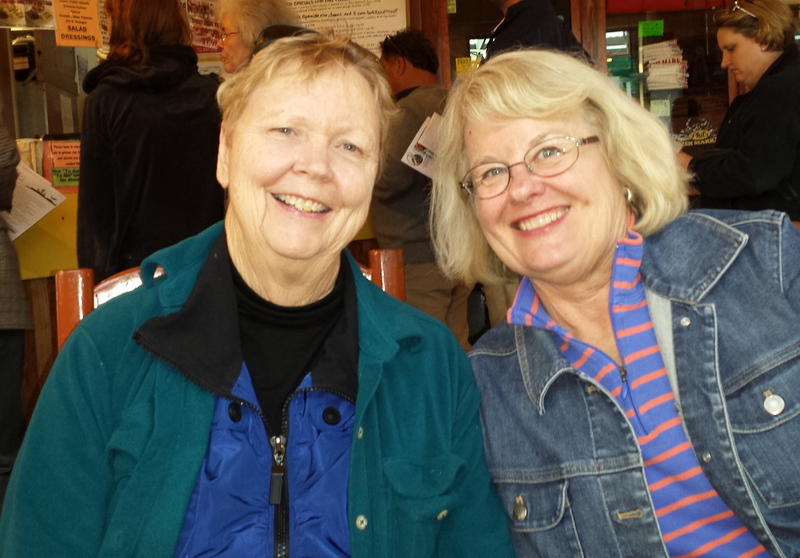 Annie Oakes Lee, a fellow museum tour guide who also volunteers at the State Railroad Museum in Carson City, asked Jerri and me to join her at that museum this past Thursday. 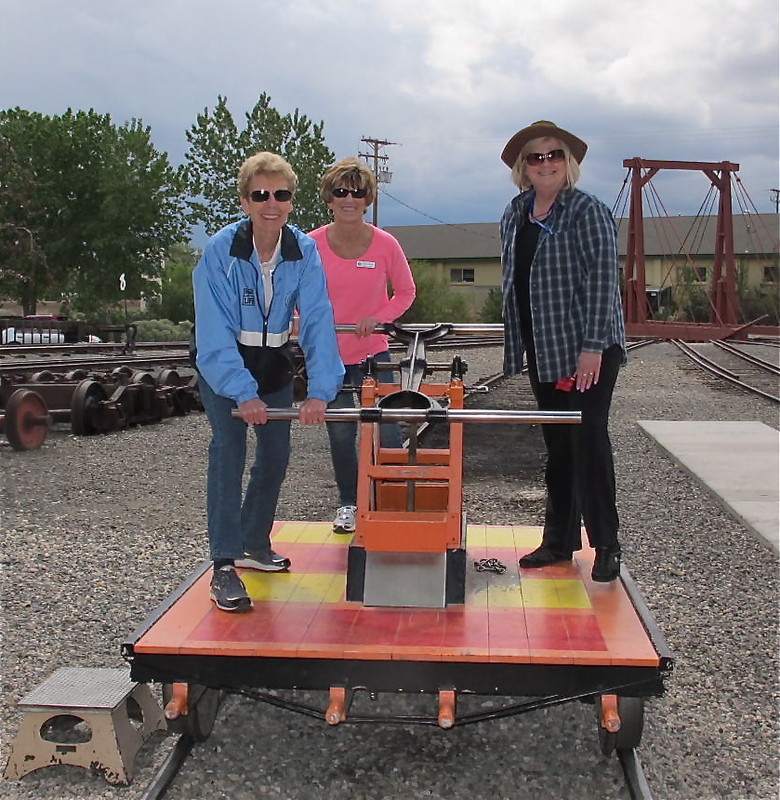 She was practicing how to take folks on the handcar and needed people to practice on. Apparently the brake is tricky and it’s easy to step on it too hard and pitch people off the car. So we went and had a blast. Annie was very proper in making us adhere to the rules and I got into trouble because I didn’t keep both feet on the car. She thought I was swinging my body but I was actually trying to get more leverage to push down on the bar. But she was right. I didn’t have both feet on the floor of the car. We got to take three or four rides and got excited about thinking we could race on one of those cars. That night, though, my forearms and upper shoulders were a bit tight. So maybe racing isn’t a good idea. 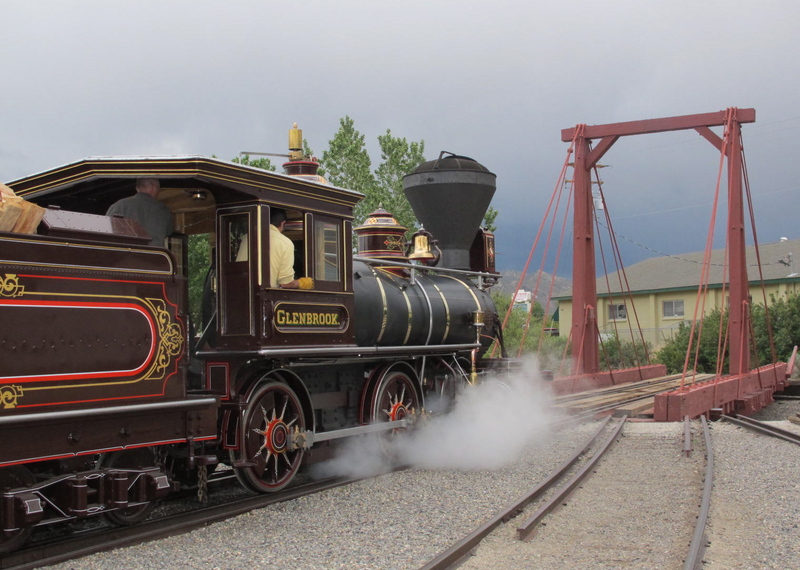 A short summary of the articles is that the Glenbrook was built in 1875 and is a narrow gauge 2-6-0 Mogul. 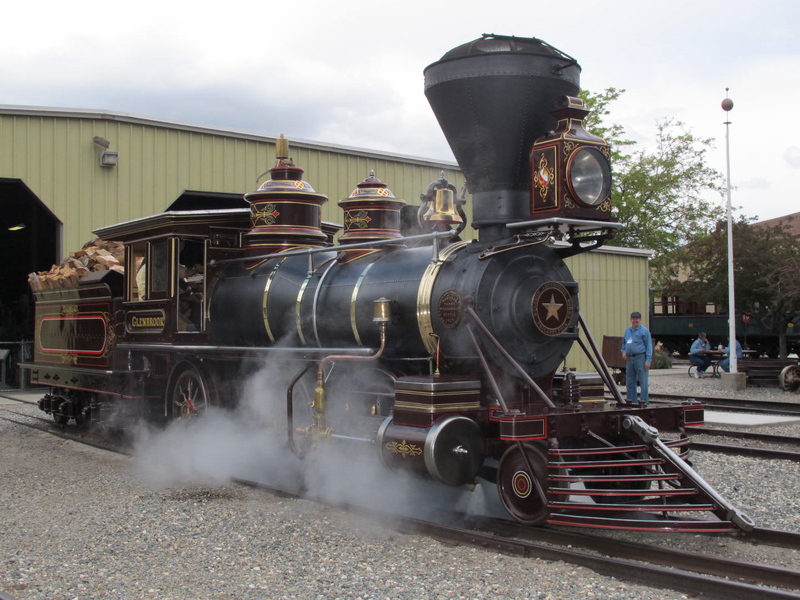 From 1875 to 1898, it hauled out lumber and cord wood from sawmills on the shores of Lake Tahoe to Spooner Summit, where the lumber was flumed down to Eagle Valley (Carson City area). From 1898 until retiring in 1923, the Glenbrook hauled thousands of tourists between Truckee and Tahoe City, CA. 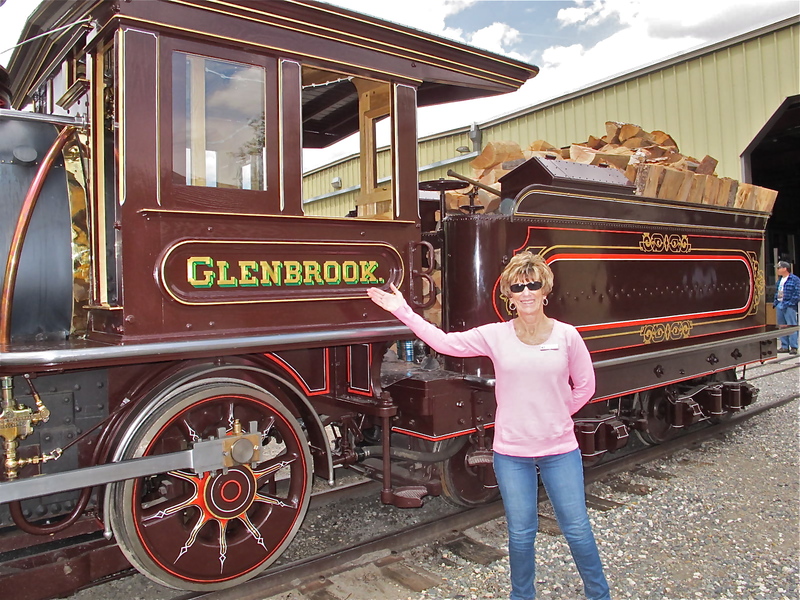 The Bliss family, the owners, eventually donated the Glenbrook to the state where it sat in front of the Nevada State Museum for many years. 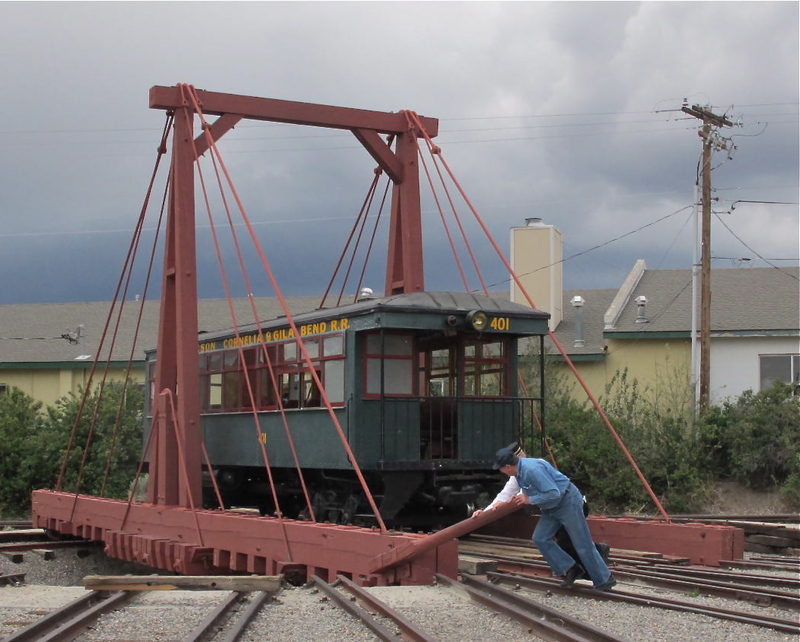 It was moved to the Railroad Museum in 1982 where restoration work began on it. Chris DeWitt, chief maintenance officer, and his crew worked for 33 years to get it to pristine condition and ready for its second debut. That’s dedication! Annie told us that it takes 3 to 4 hours to get the engine steamed up so that it can go. We were there at the right time and got to see it move, be turned around on the turntable and then run on another track for a bit longer distance for some official photographers. I’m not really a train aficionado but this was fun to see. 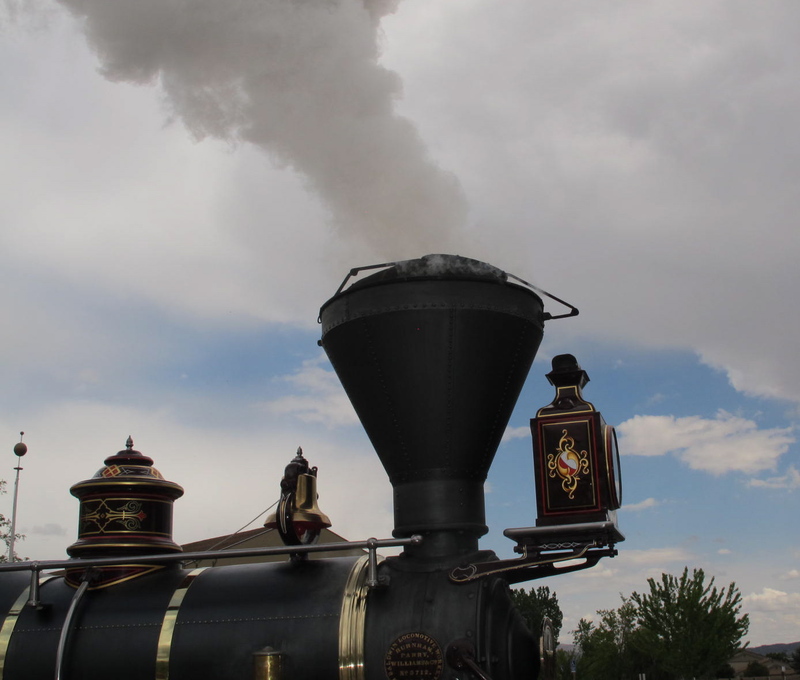 The steam, the whistle and the soft choo choo noises as it sat idling were somehow a bit soothing. Mom used to talk about hearing steam engines in Santa Ana in the 1920s and she thought the noises were comforting. I could see/hear what she meant. The turntable is operated by hand. The engine and wood car (I thought this car was called a coal car, but I don’t know what the official name is) park on the turntable and men physically push the turntable around so that the train can move to another track. We watched the men push the turntable and then the engine backed up onto another track. 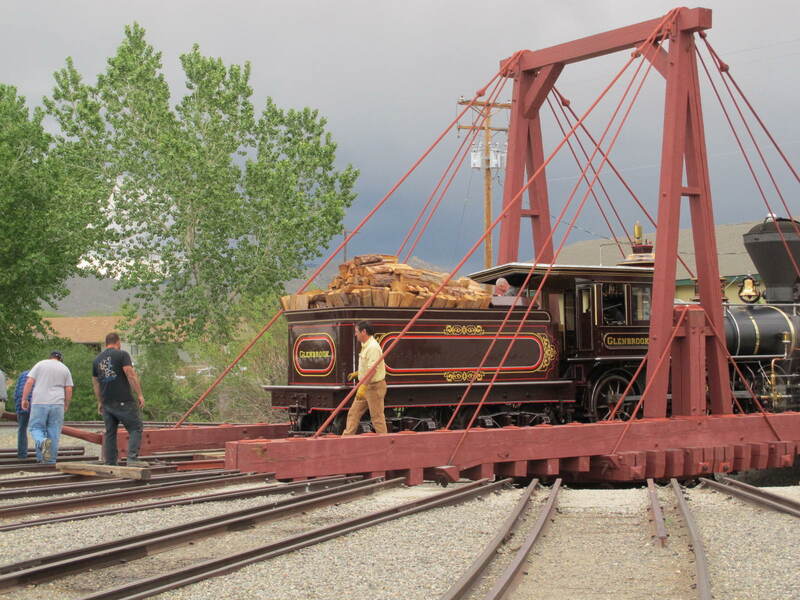 The turntable must be on pretty good ball bearings or something because that engine plus the loaded wood car (coal car) must weigh many tons. While we were checking out the Glenbrook and admiring it, a trolley car was rolled out. I don’t know how old it is, but it looked pretty ancient to me. 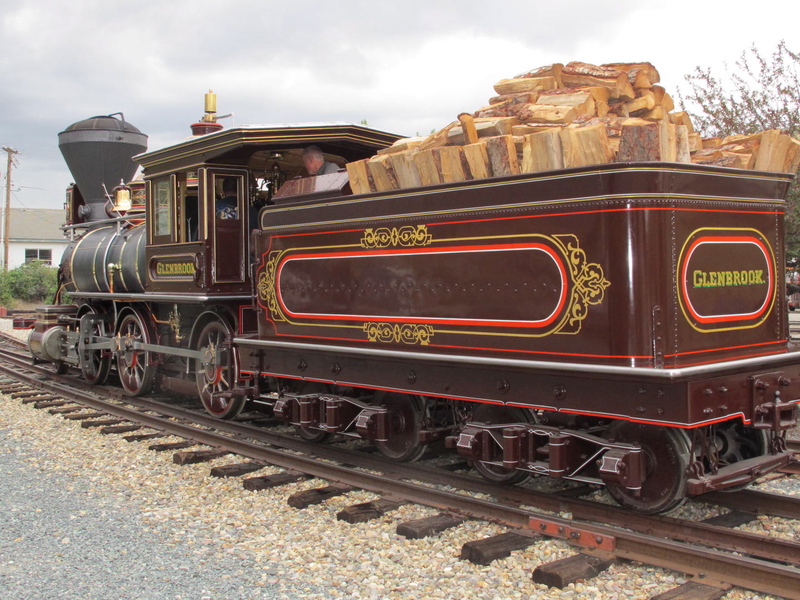 The able craftsmen at the Railroad Museum had restored it also. Annie told me it ran on diesel fuel. It took its turn on the turntable and you can see that it took only two guys to turn it so that it could get on its correct track. A tour for about 50 school kids was scheduled for noon that day and they were going to take a ride on the trolley. Annie was also going to give them rides on the handcar. These kids had walked from wherever their school was (due to buses costing too much for field trips) and then ate their lunch on the museum grounds. You can see in the pictures that the skies were threatening and we could hear thunder rumbling in the distance. Jerri and I left just when the kids were getting ready for their official tour. We weren’t more than 5 or 10 minutes down the road when the rain began to pour. I heard later from Annie that they were able to get most of the kids finished with their handcar rides before getting drenched. I don’t know how the rest of the tour went, but I felt sorry for them having to walk back to school in the rain. I was very happy to get our special tour of the museum and appreciated Annie letting us “play” on the handcar. It was a special privilege to get to see the Glenbrook before the official public unveiling on the 23rd. I look forward to hearing its whistle and the museum’s other steam engines’ noises in the future as they take people on rides around the museum tracks. Maybe we’ll get to take some rides on it when they get some cars to attach to it. 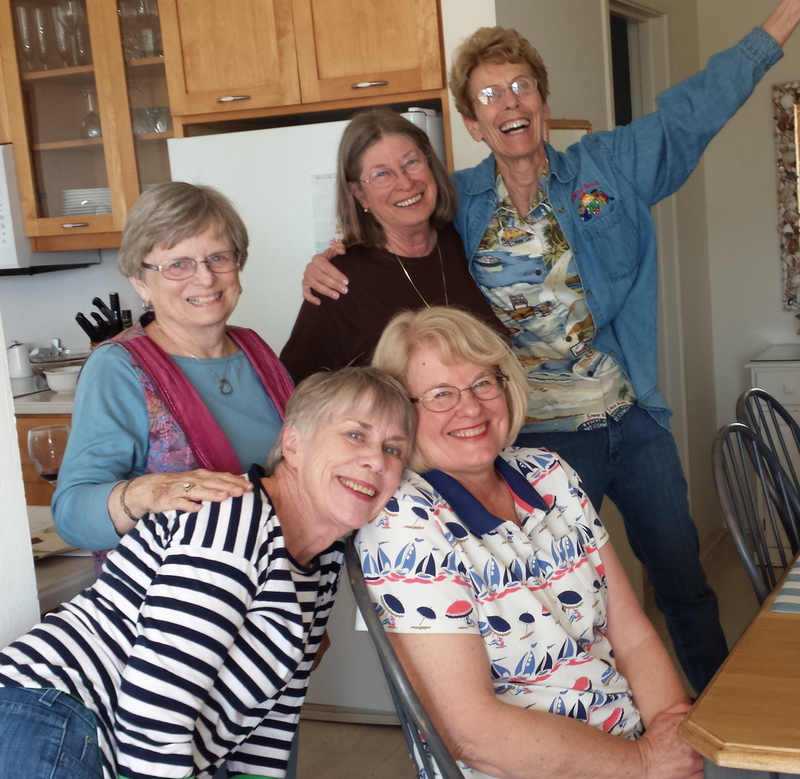 Lynda had picked up Dot at the San Jose airport in the morning and they got groceries for the first night’s dinner. Diana and I picked up Susan at the same airport that afternoon and then zoomed to Pelican 10. 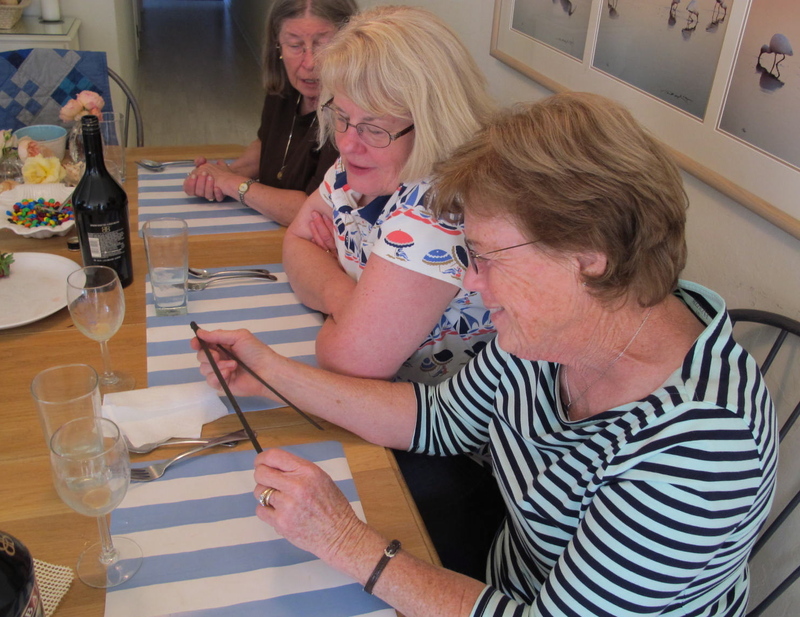 It wasn’t long before the first bottle of wine was uncorked and the festivities began. You don’t see Shoo in this picture because she had just come home from Holland on May 4 and didn’t join us until the afternoon of the 6th. She said the tulips were exquisitely beautiful and her Dutch adventure was excellent. We were having a good time even before the first glass of wine! Many years ago, Trish had the foresight to save many of the letters we had written to her during our freshman year of college. They were written primarily during the first semester when we were all filled with wonder, awe, and dread of what was to come in our maiden year of college. She distributed them to us and it was fun reading our thoughts. There were thoughts about classes, parties, kissing, making out, and the whole ball of wax that one goes through going away from home for the first time. That of course, led to more discussions and memories of college. It seems so long ago (and it was), but we remember those days just like it was yesterday…perhaps with some embellishments? Who knows? It was fun to talk about those crazy days. 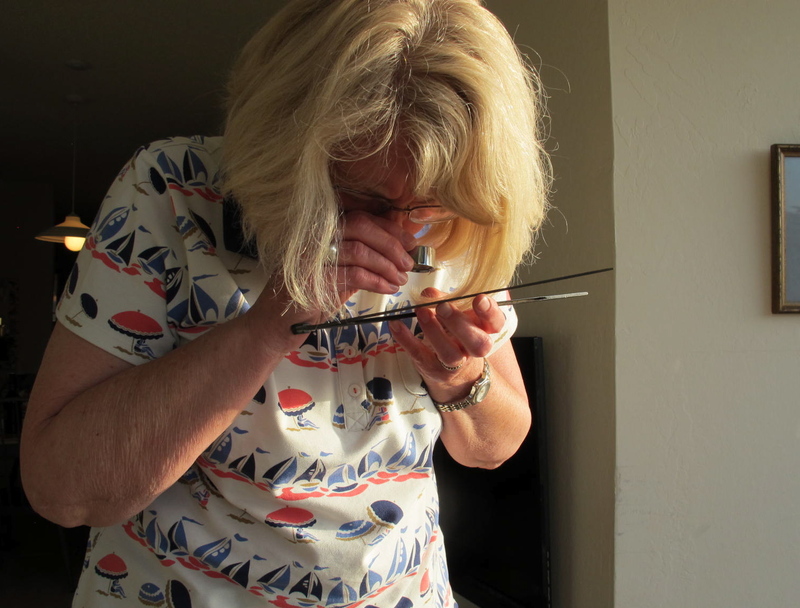 Trish had an antique of unknown nomenclature that we all examined. Diana even checked it out with her loupe, but she and we never arrived at any conclusion as to what it is. I think it has something to do with surveying, but we don’t know. We didn’t walk as much on the beach as we usually do because of wind, weather and other activities. I think we needed Sherry to jump-start us in that direction. 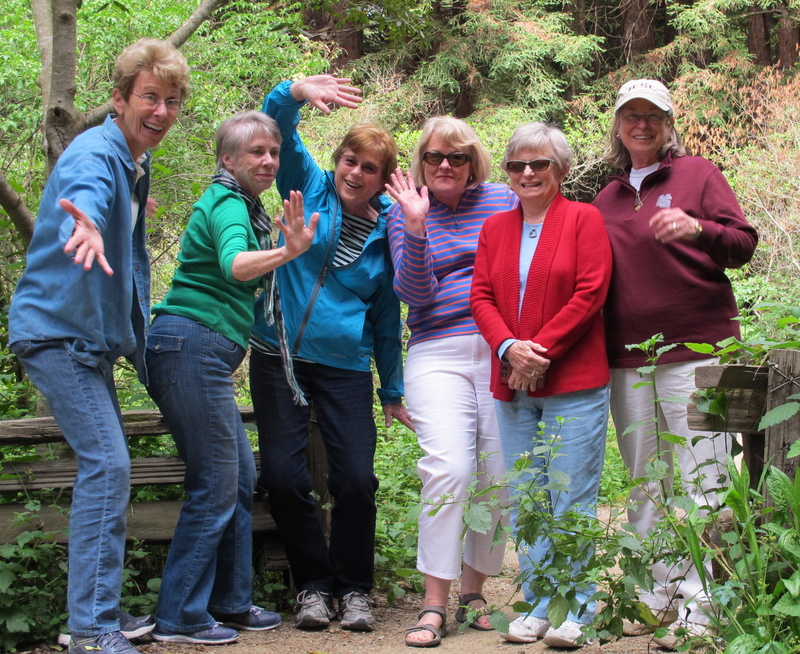 But we did take a hike in the Nisene Marks State Park , which is four miles north of Aptos. 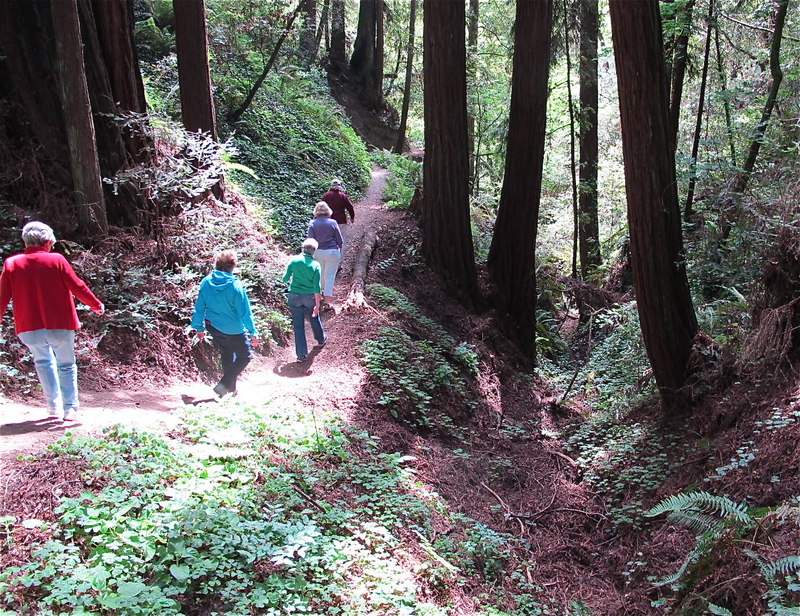 The park offers rugged semi-wilderness, rising from sea level to steep coastal mountains of more than 2,600 feet. Once the site of logging operations until the 1920s, visitors can still find evidence of logging operations, mill sites and trestles in the park. The land was donated to the state by the Marks family in 1963. 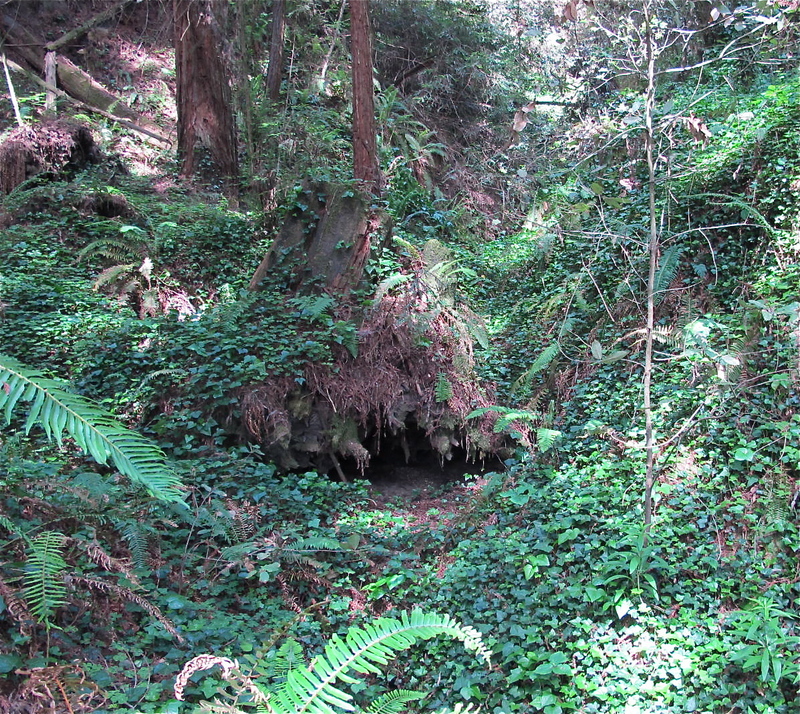 One note of interest is that the park was the epicenter of the Loma Prieta earthquake in 1989. Lynda’s house sustained quite a bit of damage from that quake. What a beautiful park! 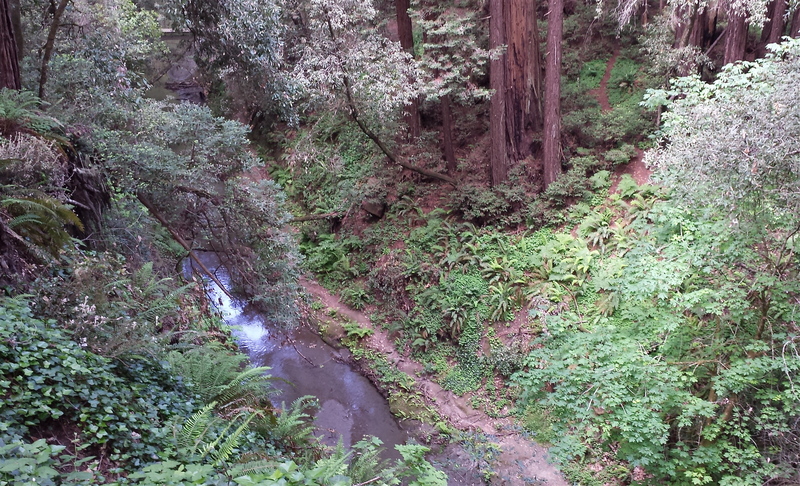 It’s a hidden delight for hikers and bikers. What a beautiful park! It’s a hidden delight for hikers, bikers and walkers. 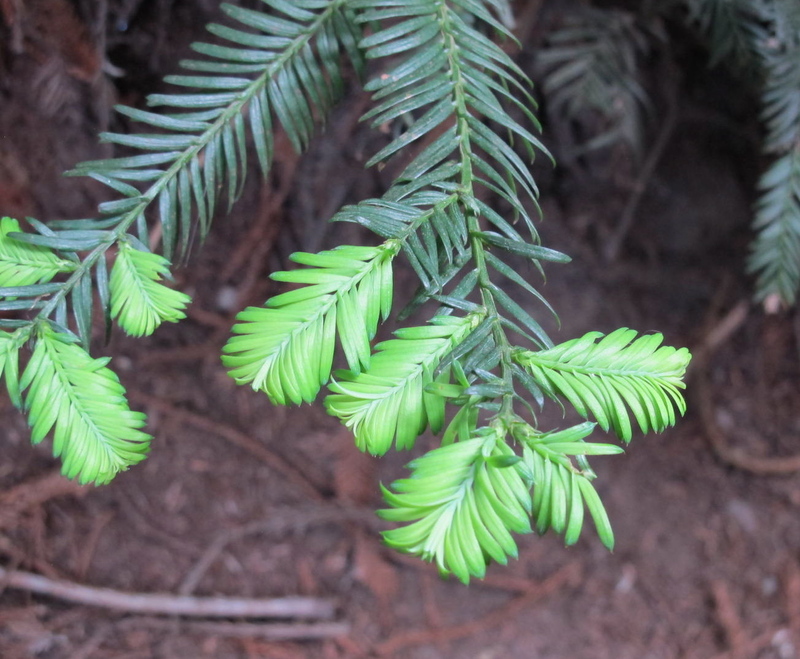 The forest has redwoods, some new growth, many ferns, wildflowers, redwood sorrel and even some poison oak that we all deftly avoided. It’s like a little Eden in here. 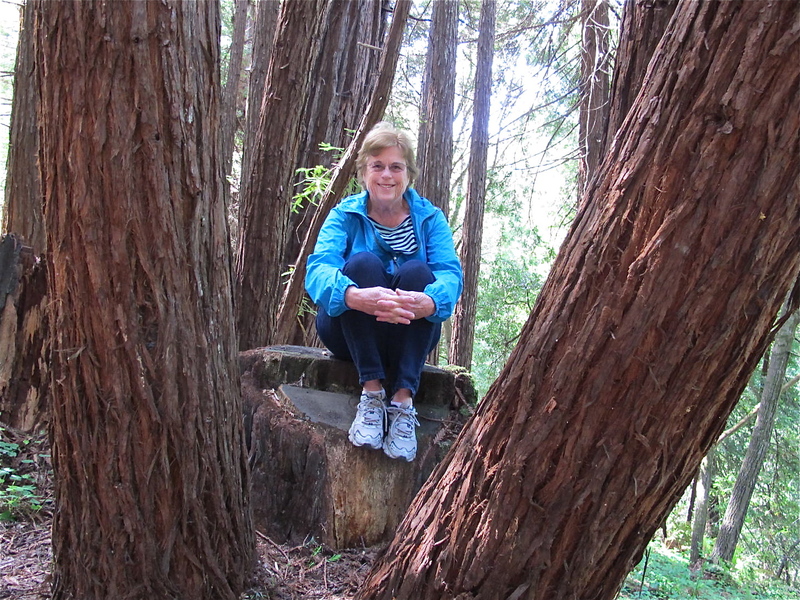 Lynda is an elfin spirit in the forest. Our first total group walk on the beach produced the usual views of the godwits poking their beaks into the sand, sanderlings scooting along the shore, pelicans flying overhead, and grebes floating and then diving for food in the waves. But we also espied many purple sail jellyfish washed up on the shore. A by-the-wind sailor…not very big. They are perhaps an inch and a half to two inches long. 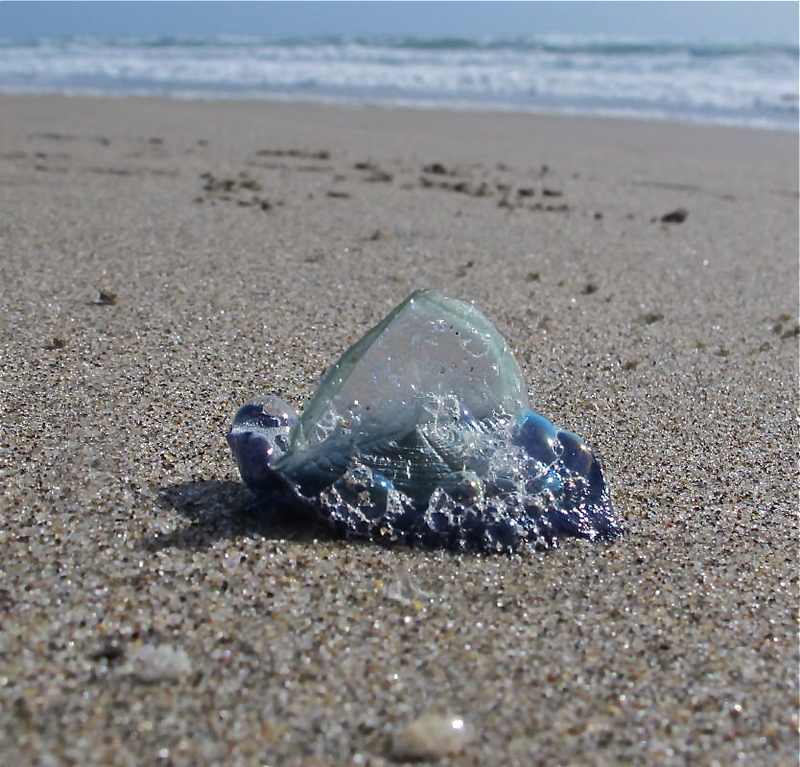 An invasion is afoot along beaches from Oregon to California: Millions of glassy purple, jellyfish-like sea creatures that look like sailboats have been washing ashore. Known as “by-the-wind sailors,” they typically live in the open ocean, but when warm water and storms draw them near shore, the wind blows them onto beaches, where they die in stinking piles. These creatures, whose scientific name is Velella velella, aren’t actually jellyfish, but hydrozoans, related to the Portuguese man-of-war. (according to Live Science.com) They are pretty, in their own way, and are harmless to humans. Luckily, they were not stinking on the Pajaro beach. 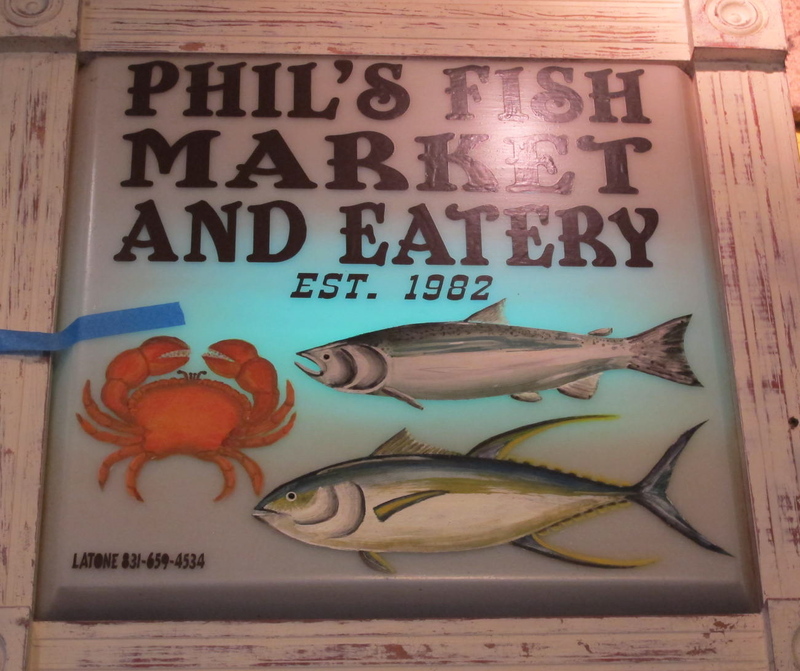 For dinner that evening, we drove to Phil’s Fish Market and Eatery at Moss Landing. I meant to get pictures of our plates, but was too engrossed in my own food. Oops. Suffice to say that we all enjoyed our vittles very much and were stuffed to the gills. Later on, that didn’t stop us from enjoying Diana’s famous berry cobbler made with Jacobs Berry Farm berries. Delicious! 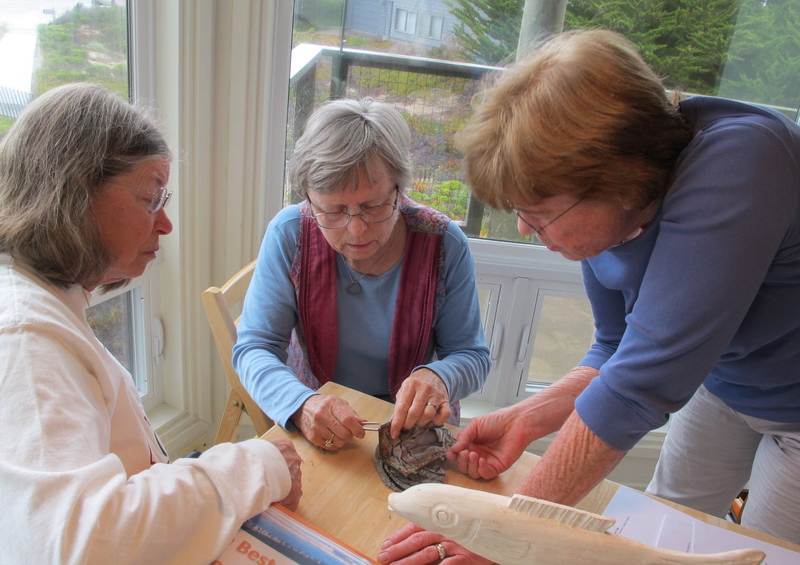 The next morning, Susan, Dot and Lynda helped restore an antique beaded purse for Diana. Such talent in our group! 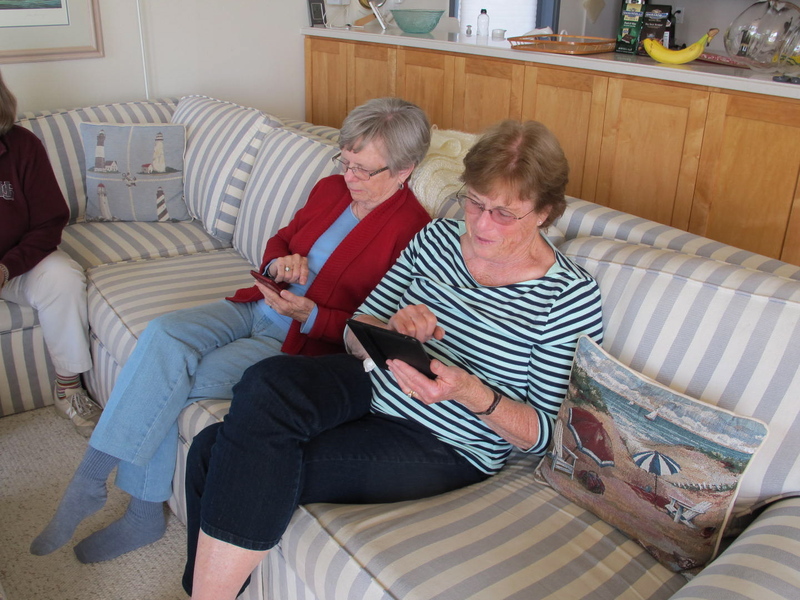 As you can see, we all have our electronic toys and phones upon which can be played games. For a bit, we were pretty much occupied with playing Dropwords. I did pretty well with it when I was working with Dot, Susan and Lynda. Alone, I was too slow. 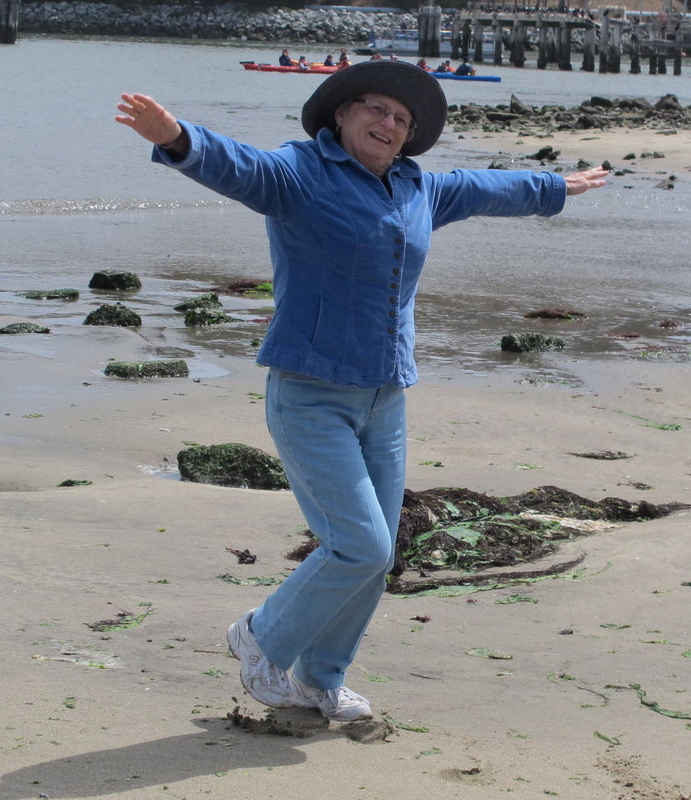 We tried to get reservations to take a tour of the Elkhorn Slough, but they were sold out on the day we could all go. 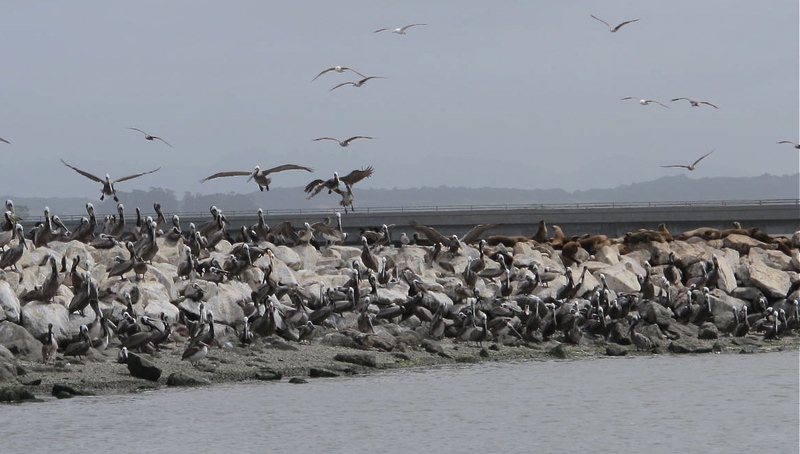 So we drove to the mouth of the slough and watched pelicans and sea lions on a breakwater. 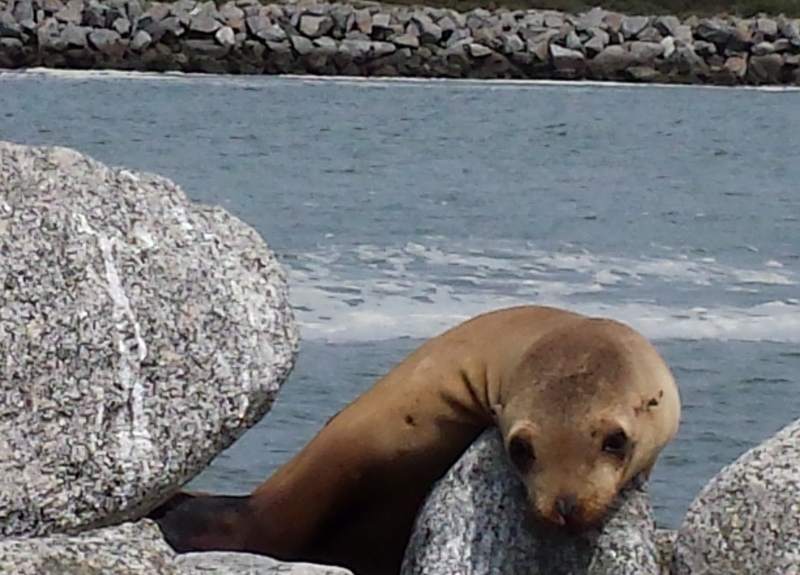 We even saw a sea lion pup, which didn’t look too happy. Many sea lions are not getting enough to eat these days due to warming waters that drive their food supply to cooler areas of the ocean. Dot is enjoying the sea breeze and trying out her own wings. 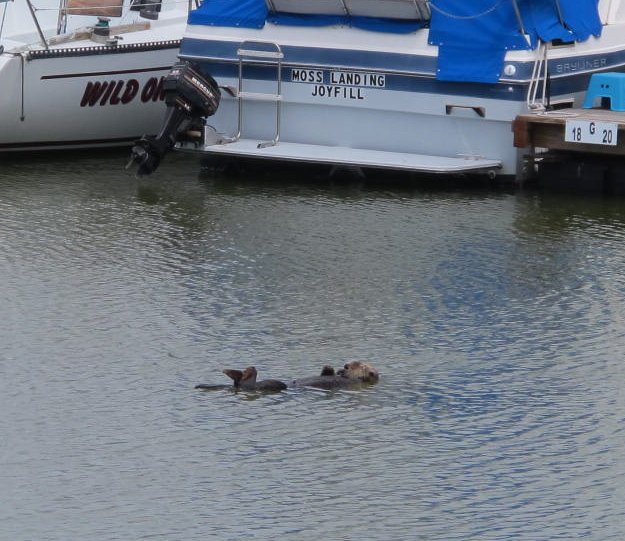 We didn’t get to take the slough tour but we did see one otter floating on his back near the shore of the marina. Some locals told us he is there quite often. 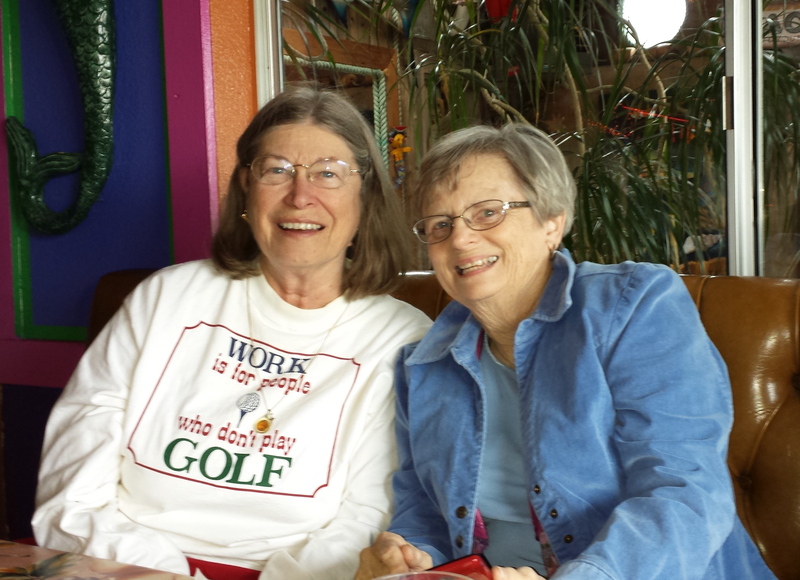 We had our traditional lunch at the Whole Enchilada at Moss Landing and enjoyed a variety of Mexican food delights. Susan had the biggest chili relleno I have ever seen. I thought there had to be at least 2 or 3 peppers in the dish, but it was just one. Wow! What a meal! Again, we didn’t get our traditional picture marking our presence at the Whole Enchilada, but we do have a few. Ray, the proprietor, always seems to come around to talk to us when we have lunch there. He always talks a bit, asks who is in charge and then gives her a pitch about being in business together. Then he gives her a Lotto ticket saying he gets 50% of the winnings. This year, we couldn’t decide who was in charge, so he had us each choose a number. Diana has been the one in charge before and didn’t want to do it again. However, she picked the exact number and then felt lucky with the ticket since she was spot on. But, alas, it was a loser. Rats! Diana is always a good sport about these things and we admire her for going with the flow. It began to rain during our lunch but we walked to a couple of nearby shops to check out their wares. The local boutique made out quite well with our group. After our walk through the rain, making purchases and checking again on the marina otter, we drove on home to make sure the wine was still in good shape. Well, that is not totally true, but there was a lot more conversation. It seems as though we always have something interesting to talk about. I always learn a lot of stuff when I’m with these ladies. It is such a joy to be able to gather each year to celebrate this group. 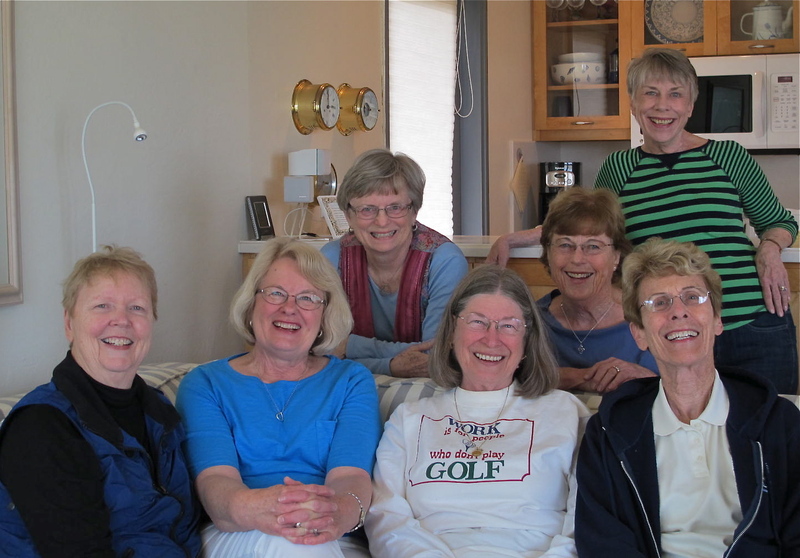 It is not often that a group of high school gals bonds in such a way that the relationship lasts a lifetime. When we come together, it’s as if we haven’t been apart for a long time and we coalesce back into the amazing group we’ve always been. (Not that we aren’t supporting throughout the year, it’s just now it’s face-to-face) We always know that the group will be there to help in any way it can. It’s just great to be together with these ladies. Thank you all for being you! 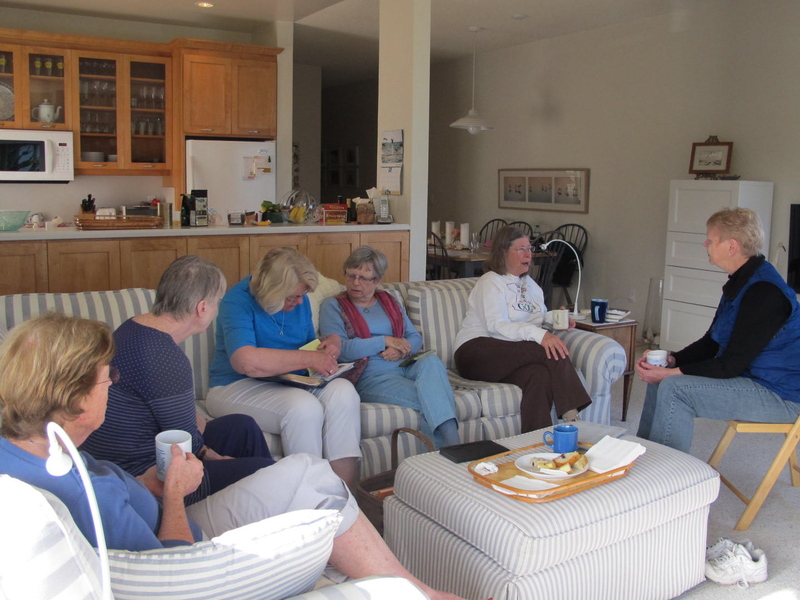 And thank you, Lynda, for contributing some of the pictures.